An issue that was a result from the Los Angeles Aqueduct projects is dust problems in Owens Lake. In the United States Owens Lake is the largest source of PM-10, which stands for Particulate Matter less than 10 micrometers in diameter, these particles are so small that they can get into your lungs and cause serious health problems. I’m attempting to map out how and why these particles can travel hundreds of miles away and demonstrate the importance of dust problems and what can we learn from Owens Lake. The maps above are my first attempt in organizing my research and trying to find a correlation that explains what is happening to the dust in Owens Lake. I began by locating other Lakes around the world that have dust problems. A well known lake for its water depletion is the Aral Sea and in comparison to Owens Lake the Aral Sea is about 100 times larger. I then began trying to find an example that can show the extent of dust problems and found that Africa’s dust can reach as far as the coral reefs in the Caribbean. Although Africa’s dust problem is derived from other factors of desertification than just depletion of Lake Chad; it’s important to understand dust blown away hundreds of miles can have a negative impact on our environment and health. In my attempt to demonstrate why Owens Lake has such a sever dust problem compared to other salt flats and arid places I began mapping out Pleistocene lakes that existed over 10,000 years ago to understand the development of Owens Lake. My next objective is to locate salt flats and arid regions in the state of California as a result of Pleistocene Lakes. 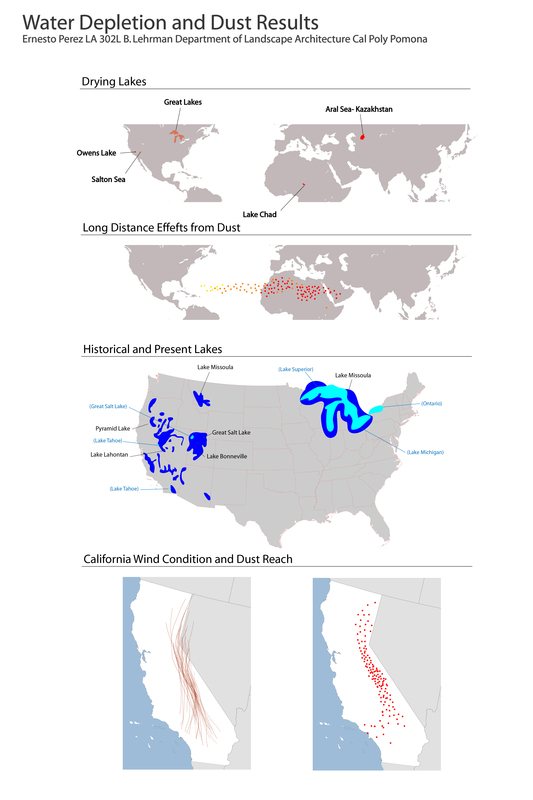 Finally, I attempted to make a connection between the wind flow of Owens Valley and extent of Owens Lake dust problems. My objective now is to create a map of California with quantitative notations that can merge all of my research.